UFC president Dana White states that the women's flyweight title is vacant, Impact Wrestling's viewership, great interview with Martin Goldsmith on the WWE's history in the UK, updated card for UFC 228 tonight in Dallas, first matches announced for the Mixed Match Challenge, new EGGSHELLS podcast & more. **We have the latest installment of Chris Charlton’s EGGSHELLS Podcast Companion posted with guest Joe Gagne going back to the year 2000. On this episode, they discuss the tumultuous period of 2000 with the fracturing of the scene with Pro Wrestling NOAH’s birth, New Japan and All Japan working together, Jushin Thunder Liger moving to heavyweight, the introduction of Kenzo Suzuki (and who the WWE initially had their eye on), plus lots more notes from an important year. You can subscribe to the main POST Wrestling feed to catch this show every Saturday. **I’ve posted a poll for readers to predict the outcomes of tonight’s main card bouts at UFC 228 on the POST Wrestling Forum and I’ll read the results on Sunday’s UFC 228 POST Show. **Impact Wrestling has become the most difficult wrestling program to gauge viewership on. After free-falling throughout August against NFL pre-season action, Impact’s number was up this week going against a regular season game that drew 19 million viewers. This week’s Impact averaged 236,000 viewers on POP TV, their highest number since August 2nd, although still the fifth lowest number of 2018. The NFL game started at 9 pm due to a rain delay and gave Impact the jump from 8-9 pm. Next week’s Impact will be their final show from the recent set of Toronto tapings and then will air the shows from Mexico, which will be filmed next week. **The Raw crew will be in Mobile, Alabama tonight with Roman Reigns vs. Braun Strowman advertised for the main event along with Dolph Ziggler & Drew McIntyre vs. Seth Rollins & Dean Ambrose. The SmackDown starts their tour in Amarillo, Texas tonight with AJ Styles vs. Samoa Joe vs. The Miz advertised in the main event, Jeff Hardy vs. Shinsuke Nakamura for the United States title and Charlotte Flair vs. Carmella for the women’s title. The Raw crew heads to Biloxi, Mississippi on Sunday and SmackDown is in Lubbock, Texas. **Metro in the UK has an extensive interview with Martin Goldsmith, who is being honored at Wrestling MediaCon this weekend. Goldsmith was instrumental in the WWE’s expansion into the UK and specifically working in conjunction with the SummerSlam 1992 event from Wembley Stadium that was headlined by Bret Hart and Davey Boy Smith for the Intercontinental title. **New Japan’s Road to Destruction card on Sunday will feature Satoshi Kojima’s return after tearing his ACL at the beginning of the year. Kojima will team with Hiroyoshi Tenzan, Yuji Nagata & Manabu Nakanishi against Togi Makabe, Tomoaki Honma, Juice Robinson & David Finlay in the main event. **The WWE stock closed at $87.02 on Friday. 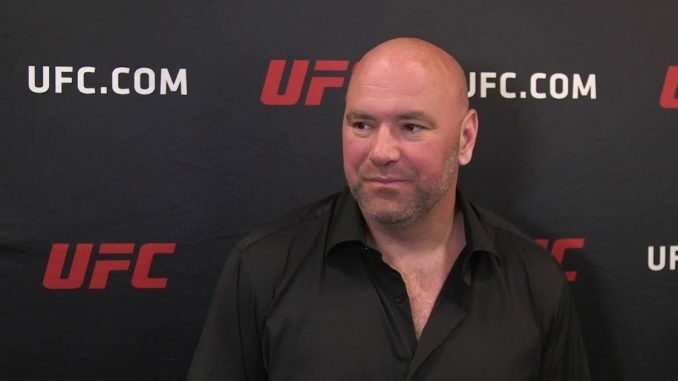 **With Nicco Montano’s withdrawal from tonight’s UFC 228 card, UFC president Dana White has stated that the flyweight title is vacant. Montano was sent to the hospital in the hours leading up to Friday’s weigh-ins and it was ruled she would not compete against Valentina Shevchenko for her scheduled flyweight title defense. White spoke to TSN’s Aaron Bronsteter as well as Megan Olivi on FS 1 to announce the news that Montano would be stripped of the title and Shevchenko would fight another female to determine the new champion. White would not elaborate on who they were in negotiations with to fight Shevchenko. Montano was crowned the inaugural women’s flyweight champion last December defeating Roxanne Modafferi in the finals of the Ultimate Fighter tournament but has been affected by injuries and illness throughout 2018 that kept her out of the cage.